Jersey Spirits Distilling Company, located in typically “Jersey-style” commercial office park set just a few miles from thundering routes 46 and 80. They are hand distilling tasty, award winning spirits one drop at a time. Founded in 2005 by a tight group of passionate Jersey residents, this Jersey-centric distillery may not be on everybody’s radar just yet. But don’t let that stop you from discovering something that is quite delicious and surprisingly well made. From the gleaming tasting room with a little history of distilling in New Jersey on the walls to the tenaciously designed distillery, this is an extremely impressive operation. They are a distillery mind you, their license says that no food is prepared here aside from some Pepperidge Farm Goldfish crackers-a cheese driven compliment to their communicative spirits. The American Distilling Institute awarded Jersey Spirits Distilling Company their Bronze Medal for their “Specialty Spirit” named Hopmanic Citra, which is a play on the excellent beer brewed at a microbrewery right next door. And their White Maple Whiskey- quite delectable- and winning a Bronze Medal, also from the ADI- this one in the category of Flavored Whiskey. But rather than rest on their laurels, Jersey Spirits Distilling Company is working towards their goal of creating flavor through quality ingredients. The Hop project is one of those ‘way-out’ ideas that is incredibly intriguing and creative. Hops are an essential component of beer, providing the sharpness and texture against the softer grains. Hops are essentially the spice balance in any given beer. British beers have very soft hop notes, whereas American beers can have funky hop driven beers, like their modern styled, IPA beers, bringing new flavors into the distilled spirits arena. These beer- influenced spirits are unlike anything on the market and deserve a deeper dive. The Hop Maniac –Citra- this is sharply green in nose- green hops- green herbs-spicy hops-freshly cut hay... HOPS straight up your nose! It’s piquant, sultry and scintillating-all at the same time. The Hop Maniac- Mosaic- oh, this smells like freshly cut “grass” and snipped French Herbs. Fresh and smoky-green, the hops burst out-enticing your imagination-directly out of the gate. There are Asian spices woven all around each sip, anise comes into view, swiftly plunging into a titanic pool of Pacific Northwest Hops. Noteworthy liquid. Catch the Mosaic, if you can! 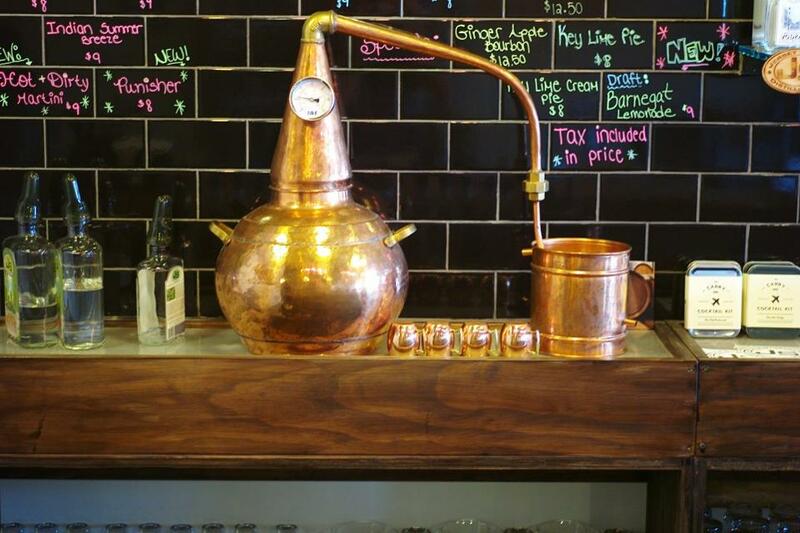 Their hand-crafted gin was a huge surprise as well. Bursting with white flowers, tobacco blossoms, quince and Caribbean baking spices, such as nutmeg, clove and cardamom, this is an American styled gin that is quite rambunctious. A Pink Gin would be a fine jumping off point for cocktails. This is no more than a frozen Martini glass, rubbed with lemon zest, with the addition of Angostura Bitters and usually sweetened Plymouth Gin. In this case the use of the DSP.7 Gin from Jersey Spirits Distilling Company would make any thirsty person clamor for a belly ache. Why a belly ache? Because the original purpose of the Pink Gin was certainly for relaxation, that is for certain. It also would heal the gut from horrible maladies like dysentery, or a peptic gut. Seasickness can also be cured with Pink Gin. And the millennials just go crazy for gin that is pink in color because it looks like rose’ wine. Don’t even get started with that trend. This gin is far beyond the pale. The DSP-7 is WORLD CLASS stuff. American Gin with a very Pacific Rim (botanical) twist. Tasting Notes: DSP 7 Gin: Tremendously floral in the nose, yet finishes dry, but certainly not sweet, roasted pineapple, crusted brioche, toasted nuts, maraschino cherry liqueur (again...DRY) and pools of Chinese Five Star spice in the nose. Each sniff gives way to smooth notes of almond paste and crushed, herb crusted-grilled figs. Bursts of sea salt bring the attentive drinker to the bar with a further tangle of the namesake juniper and hints of crisp cornbread dumplings across the palate. A final flourish of roasted fruits-speeding headlong down the throat. This is perfect for a tonic and gin... As opposed to a plain gin and tonic. Both expressions are impressive by what they don’t do. Rum that is so carefully crafted is usually prohibitively expensive. Not so with Jersey Spirits Distilling Company rum. They do some really funky stuff here. Their rum is not priced like the ultra-premium stuff that clogs the shelf with their ambiguous stories-written for armchair sailors. Take some of their Barrel Aged rum and mix it with coconut water ice. Yum. It’s real craft rum, so find it if you can. They also do several wonderful whiskies but did we talk about the vodka? Their vodka, instead of boasting how many times it is filtered- is not what the consumer would expect. Vodka that is bright and refreshing. The nose is pure and clean, yet rich. It’s the anti-vodka! White: Bourbon Mash: white fruits, sweet grains- not acerbic nor candy-like. Sophisticated, bold and pure. Dig this stuff in a brilliant take on the Mule with Pickett’s Spicy Ginger Beer Syrup and Seltzer water. Cross Roads Bourbon- the first in NJ since Prohibition! Brightly lit with caramelized hazelnuts, toasty brioche smeared with ricotta and berry compote, crumbled pecans over the top to finish.